We offer digital and online proofs, it's up to you! Our InSite proofing system allows you to proof your jobs online. Online proofing means you can check a job from anywhere. Multiple people can be proofing the same job at the same time. 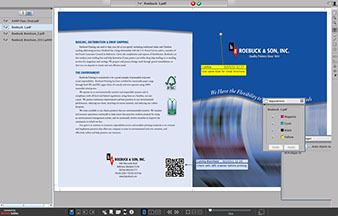 Roebuck Printing's fully equipped and expertly staffed electronic prepress department provides an efficient and economical beginning to your printing project. 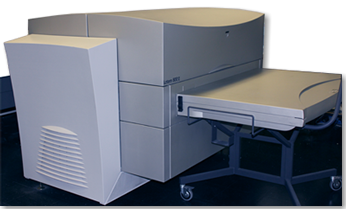 Our state-of-the-art computer-to-plate equipment enables us to give you the highest quality print reproduction, while online and digital proofing systems increase workflow efficiencies. 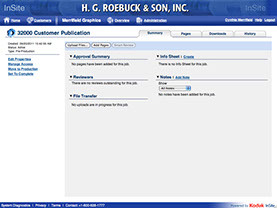 The experienced staff at Roebuck Printing welcomes any questions you may have about your job and, in fact, our clients often seek us out for solutions to software and file handling issues. 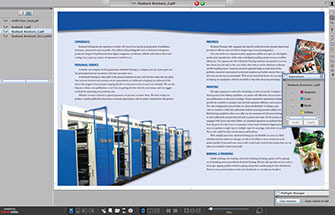 Using this proactive approach helps us avoid many of the problems commonly encountered in electronic prepress and further ensures that your job turns out the way you envisioned. With an eye toward the future, we are committed to keeping our equipment, software and skills in step with advancing technology. PDFs make life easier. The best are, at the least, PDF-X in format. • If your publication uses spot color inks, your PDFs must be PDF-X1a compliant. • Make certain that your PDF includes 1/8 inch bleeds, if needed, and offset crop marks at least .187". • For Quark XPress PDFs, ensure that vector art (text, logos, etc.) are not overlapped by transparent items such as drop shadows. Bring text and vector art to the front, or use clipping paths, to keep the vectors crisp and clean. • Use CMYK, not RGB, for your document color space. Convert files, including links, to CMYK before you create your PDFs. • Convert spot colors not printed as spot to CMYK before you create your PDFs. • For best reproduction on press, keep small black text 100% black. • Do not submit your publication files in printer or reader spreads. Web presses have greater limitations in the density of ink allowed. You can help your publication look its best by ensuring that your images use ink densities not greater than 280. That means the values of the darkest area of your CMYK color image should not add up in Photoshop to more than 280. Use U.S. Web Coated (SWOP) or U.S. Web Uncoated when setting up your Photoshop Color Settings preferences.